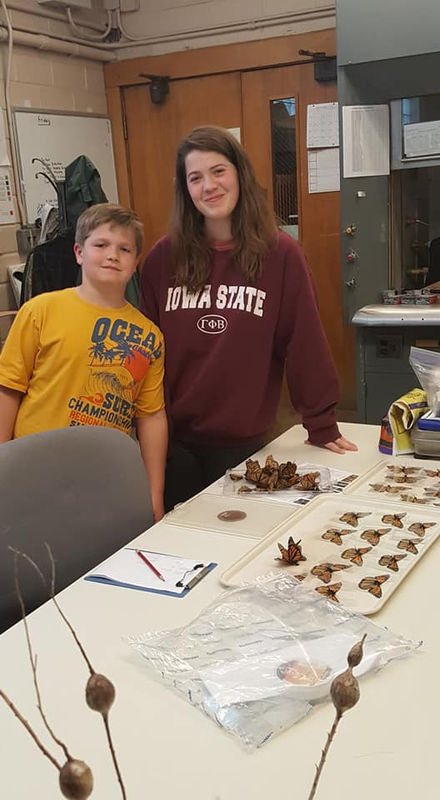 Melanie Aust (left) is an undergraduate research assistant with the ISU monarch butterfly research team. Aust, a native of Glenwood, Iowa, is a senior in animal ecology and a member of Gamma Phi Beta sorority, Environmental Science Club, and Fisheries and Wildlife Biology Club. She has worked with the monarch team in the field and in the lab since 2018. What did you enjoy the most about growing up in Iowa? The thing I loved most about growing up in Glenwood, Iowa, and then later in McFarland, Wisconsin, is that people are very friendly and family is a huge priority. That is because, in my opinion, families often live and work together in Iowa. Why did you choose Iowa State for college? I chose to go to Iowa State University because my father and most of my extended family went to Iowa State. I grew up cheering for the football team. I specifically looked at Iowa State for their Biological Pre-Medical Illustration program but then decided to focus on Environmental Science. Why did you choose Animal Ecology for your major with a wildlife option? I started in Environmental Science my freshman year but later switched to Animal Ecology with a wildlife option during my sophomore year. I wanted to focus more on conservation practices than the overall issues and quality control of the environment. Animal Ecology seemed to focus on the science of how wildlife species interact within their communities and how they can be managed and studied. Why are you interested in the monarch butterfly? Conservation management is something that I would like to pursue as a career. I was drawn to this internship because it provided my work experience hours to graduate and also because it is giving me experience in conservation projects. 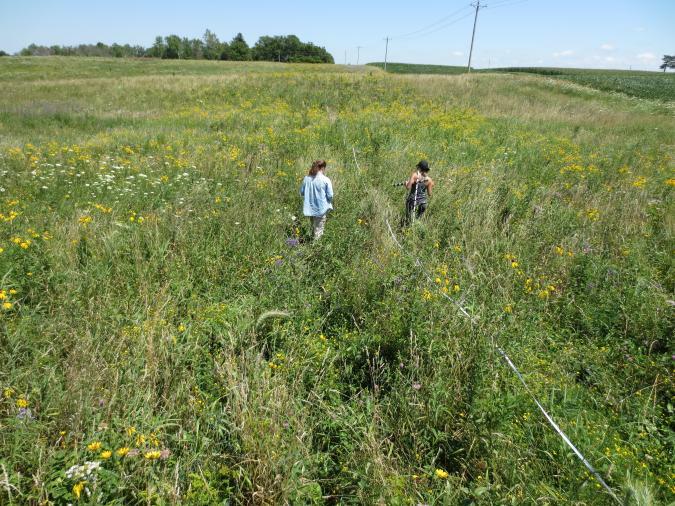 Describe your internship experience with the monarch team: I started my internship working with the monarch rearing team and maintaining the monarch colonies, greenhouse bays packed with milkweed, and the European corn borer colonies. I was never hesitant and received fantastic help learning about my new tasks and the fine details required to run the project. Following that semester, I worked throughout the summer and helped collect data for the habitat demonstration plots statewide. I am currently helping a graduate student in toxicology with her research about effects of pesticides on the monarch caterpillars. What's the most useful thing you learned as an intern? The most useful thing that I have learned as a student at Iowa State is things can be harder in college in terms of classwork but I think the best way to overcome that is to be able to ask questions and be okay with asking for help. I found it the most rewarding when I worked on homework and studied with friends and other classmates. Studying doesn’t have to be bad; it can be quite fun -- if you want it to be. How do you hope to apply what you have learned in the future? While working with the monarch team, I am learning more about conservation practices and how things like prairie sites are implemented. It is a lot of work and requires data and proof that it works especially when it may not seem like the most useful purpose of land. It is a tiresome process but one that is very necessary. This position has taught me that I need to communicate about the importance of biodiversity to people and highlight how even the littlest of changes can make a huge difference. How can Iowa citizens help the monarch butterfly? There has been a large decline in the number of monarchs in North America. Some ways that everyday citizens can help monarch butterflies: by planting milkweed in their yards and more plants that produce flowers with great amounts of nectar. Farmers could also plant milkweed and other native plants in areas that crops have trouble growing or in their ditches and banks. I have a great amount of faith in individuals, scientists, and engineers to come up with efficient solutions so that maybe we can make a difference in the loss of natural life.